Jennie Frost’s family (both sides) came to Edmonton in 1906. She discovered archaeology at age 11, studied classics at University, and taught Latin in school, university, and adult extension classes for 20 years. When she began storytelling in 1996, she leapt at the chance to interest a wider audience in the stories of ancient Greece and Rome. Storytelling also allows her to share the folk and fairy tales she’s loved since she first started reading, as well as poetry and stories from literature. Performing for adults at Fort Edmonton’s Halloween Spooktacular gave her a taste for horror stories, and meeting the epic tellers of Taylor Lake, Ontario and Vancouver, British Columbia further broadened her storytelling horizons. She has published prize-winning short stories and poetry, and one book, The Courtship of Hippodameia (Mellen, N.Y., 2005.) 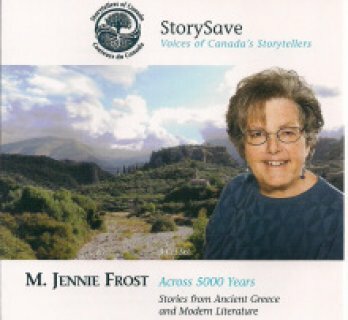 Jennie Frost has been president of both TALES Edmonton and Storytellers of Canada /Conteurs du Canada. All the stories from Greece and Rome are traditional. Child’s Cup, Ariadne, and The 24th are my own homes and are copyrighted. If you wish to use my particular versions of any of the Greek stories, please contact me first. To the best of my knowledge, all the rest of disc three material is public domain.